There are 18959 news stories on our website. The Deli - Food on the Go! Need food on the go? Make sure you pick up one of our delicious sandwiches or fresh fruit salads from our newly opened Deli. Located on the ground floor of the hotel, The Deli, offers a wide selection of designer sandwiches, healthy salads and great coffee for those on the go. Cappuccino’s is the perfect location for that quick meeting or business lunch. Continental breakfast, light snacks and fresh salads provide timely refreshment at this meeting venue. Abu Dhabi National Exhibitions Company (ADNEC) hosted its sixth Emirati Employee Forum on Monday 22 April, to ensure the active participation of Emirati employees in ADNEC’s decision making process, as well as their continued engagement in the development of programmes and plans aimed at boosting Abu Dhabi’s business tourism credentials.Featuring extensive discussions between ADNEC’s senior management and Emirati employees, the forum reviewed the effectiveness of ADNEC’s existing employee outreach programmes and initiatives in enhancing the skills of Emirati employees and catering to their professional development and training needs. The UAE gross bank assets, including bankers’ acceptances, stood at AED2.895 trillion, in March down from AED2.909.5 trillion in the preceding month, figures by the UAE Central Bank have showed. 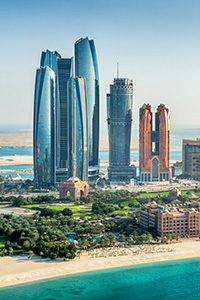 Gross credit in the banking system, rallied 2 percent from AED1671.9 trillion by the end of February 2019 to AED1675.1 trillion in March, with total bank deposits going down by AED20.1 bn driven by a dip in residents' and non-residents' deposits, by AED17.4 bn and AED2.7 bn respectively. Navdeep Singh Suri, Indian Ambassador to the UAE, stated that India’s being selected as the guest of honour at the 29th Abu Dhabi International Book Fair reflects the strong relations between the leaderships and the people of the UAE and India, as well as their vision of cultural cooperation. In an interview with WAM, Suri said that India will participate in the fair to showcase its culture to participants from over 50 countries through a senior delegation comprising 100 members at the Guest of Honour Pavilion, which is the largest at the event. During the planning stage of your wedding, there is a good chance that people are going to be throwing tips and tricks at you from all directions. Generally, this is out of love because they want you to learn from their experiences, but that doesn't mean it can't get overwhelming quite quickly — sometimes, you just need to know the essentials.